The Pennsylvania SPCA is looking for information on a dog found with stab wounds and left to die in Southwest Philadelphia. The Pennsylvania SPCA is looking for information on a male pit bull found with stab wounds and left to die on the streets of Southwest Philadelphia. According to a statement from the PSPCA, the dog's owner was located after the dog was found on the streets and rescued, but the owner has since decided to surrender the animal. The owner was reportedly out of town and the dog, named Duke, was supposedly being cared for by a friend when he reportedly escaped an enclosed yard and ran away. Duke was found on the 900 block of South 55th Street on the morning of March 25 with multiple serious injuries, including apparent stab wounds. The PSPCA said other injuries indicate that Duke may have also been involved in a fight with another dog, but that is unknown at this time. 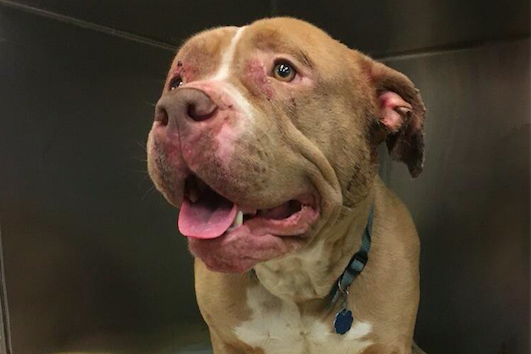 Nicole Wilson, director of PSPCA's Humane Law Enforcement, said, “while we don’t know the whole story, we do know that Duke was stabbed at some point and left to die." Anyone with information is asked to contact the PSPCA’s Cruelty Hotline at (866) 601-SPCA. Tips can be left anonymously.